A reliable source for Conveyor Parts Washers information and a resource for accessing leading Conveyor Parts Washers and suppliers. A conveyor parts washer is a system designed for continuous, flow-through parts cleaning. Parts are fed onto a conveyor belt, into a cabinet to be washed. An operator controls the speed at which parts enter the cabinet. A client can choose between a few different standard types of conveyor parts washers. Examples are the U-Bend, Monorail and In-Line washers. U-Bend washers have a turning feature, bringing the processed parts back to the operator. These work well for industrial dish washing. 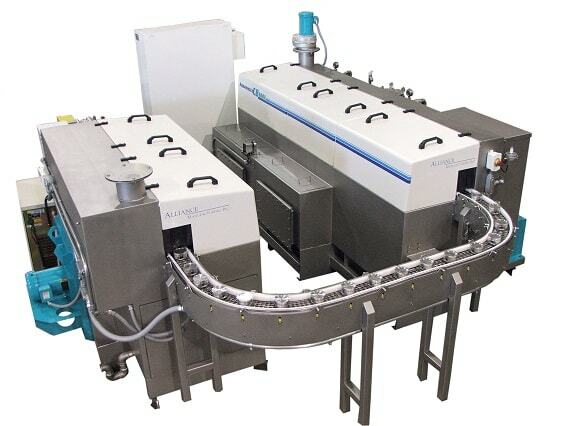 Monorail washers have an overhead conveyor and are best suited to high-volume, continuous cleaning applications. Conveyor Parts Washers A conveyor parts washer is a system designed for continuous, flow-through parts cleaning. EMC®/Equipment Manufacturing Corp. manufactures both the POWERJET® and the JETSINK® Cleaning Station for companies in various industries. Our parts washers and related washing equipment lower operating costs and increase washer efficiency. We pride ourselves on unsurpassed customer service. We are always available to answer a call for help. We advise you on how to operate and maintain your washers or how to quickly effect repairs and find parts in your local area. Niagara Systems LLC has offered turnkey custom parts washing systems for over 80 years. With our customization capabilities, our parts washing systems stand out from the competition. We are industry leaders and innovators in the world of parts washers. We offer an extensive list of parts washing equipment, from automotive washers to precision washers for medical industries. Sugino Corp. is home to top of the line parts washing equipment. We carry high pressure washing systems for highly accurate results without a heat-affected zone (HAZ). Safety-Kleen is the leading brand with the largest selection of industrial parts cleaning equipment. We are at the forefront of aqueous cleaning equipment technology with the same cleaning power of solvent to non-toxic, water-based formulas. An advantage of the conveyor parts washer is its versatility. It can be integrated into a handling line, or it can function as a stand-alone system. Similarly, the many different types of conveyor parts washers offer great flexibility to a consumer. They can be fitted to squeeze into a cramped kitchen or made to sprawl on a vast plant floor. 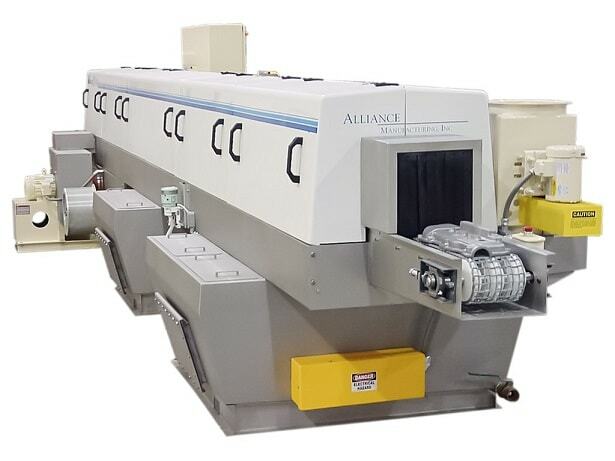 Automotive Parts Washers - Alliance Manufacturing, Inc.
A Monorail washer may be a great option to free up space, as it is conducted from overhead. Washers can be custom-made to fit many variables. Variables include but are not limited to: weight capacity, belt width, turning radius, tunnel height, wash/rinse tank size, wash/rinse tank heating method, pump output and general dimensions. Generally, a conveyor parts washer can be made to be automatic or manual, to accommodate the consumer. There is also some flexibility with the heating method, the options being steam, gas and electricity, measured in kilowatts. The best machines are made of stainless steel, as stainless steel is resistant to corrosion, ensuring a longer life. With its many options, the conveyor parts washer is a great option for someone with specialized needs.